With age comes a transition from innocence towards responsibility. Wisdom and insight enhance one’s understanding of the past. Childhood remembered is nothing like childhood. Artist Karen Joan Topping’s work quietly explores change within the human condition, as seen in her recent MFA Thesis Exhibition. Topping’s matter-of-fact videos focus on visual characteristics of children’s leisure items, such as facial features of a stuffed animal, the structure of a slowly diminishing piece of candy, or the frankness of a baby doll that isn’t being held. Her work is straightforward and void of quick edits or distractions. The viewer’s inspection can flourish while observing Topping’s uninterrupted scenes. Her videos are free of a human presence, except for Lollipop, in which a red sweet is licked for twenty-six minutes. Each piece zeroes in on its subject, in a nearly silent manner that is out of the context of raucous childhood play. In this way, viewers are taken to a simple mental place, void of overt worry, like a curious child closely examining a toy for the first time. For instance, in Tiger, Topping projects two videos facing one another on opposing walls. A viewer can stand between them in a quiet surrounding. The videos closely pan over the toy tiger’s eyeballs and nostrils. As the camera moves around, these facial features can be read as abstract compositions or views of a strange planetary surface. 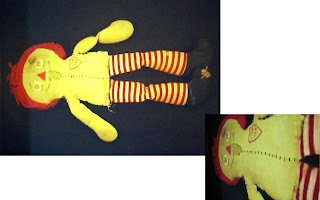 Another work, R. Ann, is a still, one-minute projection of a rag doll lying horizontally across a dark wall. Here, the artist incorporates sculptural elements, seen in the staples and padding that lead up to the doll's mouth. The projected image lies horizontally across a blank wall like a body in an open casket. An item associated with youthful jubilation appears silent, alone and vulnerable, conjuring notions of our own mortality. Topping reconstitutes our relationship to the commonplace and effectively explores notions of expectation, observation, fantasy and illusion. Her videos neither force nor ask, they simply accompany; similar to the quiet understanding a child develops with his or her favorite toy. Karen Joan Topping is an active artist in Washington D.C. and recent graduate of the MFA program at the University of the Arts in Philadelphia, PA. She is the recipient of several honors, including a Small Projects Program Award, granted by the District of Columbia’s Commission on the Art’s and Humanities. More information about Karen’s work and artistic activity can be found on her website, www.karenjoantopping.com.